I have been asking you all, for quite some time, to contribute an original devotion or devotion idea to D-mail without response. Imagine my surprise when my husband, Chuck, came up to me and handed me a piece of paper. “Here,” he said. “I wrote a D-mail. I hope it’s okay.” Well, it’s more than okay. It is very clever and thought-provoking and I am happy to present it to you this week. Thank you Chuck! What About Recom BOB ulation? Recombobulation? - I’m not even sure that’s a real word. It is apparently the opposite of discombobulation, which, by the way, is a real word, meaning “to confuse or upset”, according to Webster’s dictionary. A few months ago, Cathy and I had the chance to put both these words to use and it got me thinking. After the identification process at the check-in counter, you find yourself waiting in line for your turn to face the first TSA screener, who usually inspects your identification with a magnifying lens and pronounces that you are indeed who you and your boarding pass say you are. From there you head to that stack of gray, plastic bins and proceed to remove everything you have that is portable. In short order, you have separated yourself from your carry on, your coat, your jacket, your belt, your shoes, your jewelry, your wallet, your purse, your computer, your blackberry, your i-pod, any metal objects in your pockets and pretty much anything else that can be removed without defying decency. You stuff all of it into a couple of the bins and send them down the conveyor belt to the x-ray screener. Meanwhile, you head, stocking-footed, to the metal detector, x-ray screener or microwave detector. After a brief pass through whichever machine you are sent to, provided that the alarm doesn’t go off, you are promptly reunited with your belongings. The only catch is that instead of being neatly organized, as you were when you left home, now you find yourself (still stocking- footed) with everything from the bins in your hands and your pants in danger of falling down. In addition, you know that there are hundreds of others behind you chomping at the bit for you to get out of the way so they can do just what you are doing. To add to the confusion and activity of this relatively confined area, there are always a few pushy travelers who expect you to clear the way because they are either very late for a flight or because they just feel they deserve special consideration for some reason. Now, freeze time at just that moment. I can’t think of a better embodiment of discombobulation! Back in February, Cathy and I were flying to Boston from the Milwaukee airport. Thoroughly discombobulated as we emerged from security, we happily discovered a row of benches under a large overhead sign that read RECOMBOBULATION AREA. (In the event that you are able to receive an image as part of this D-mail, I have included a picture of this sign.) In some way, this sign gave you the feeling that it was okay to stop at this point, let the other rush of activity go by, and put yourself back together before going on. Kudos to the Milwaukee airport! 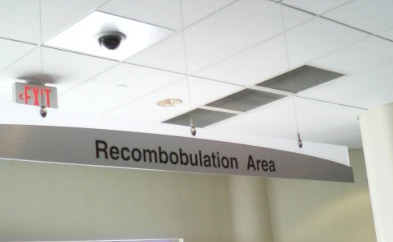 Thankfully, we don’t have to be in the Milwaukee airport, or any special place for that matter, to recombobulate. All we need to do in the midst of confusion and chaos is to stand still and seek God’s peace and wisdom and He promises He will give it. Prayer: Lord, we thank you that in the midst of turmoil, we have you to turn to for what we need. Even when we can’t see a clear way to go, you know how to recombobulate our lives according to your plan. We ask that you give us that kind of guidance whenever we need it. We also ask that you would do whatever is necessary to get us to stop and seek that place, where you are waiting. Remind me when life seems overwhelming, that I have you to hold me up and that it is in the midst of my shortcomings that your strength provides what I need. It is a comfort for me to know that you are always there. Amen. DON”T PRAY that God will turn to America to bless her, but rather that America will turn back to God to be blessed by Him. 4) Simon of Cyrene – Hebrew resident of Cyrene in North Africa. He is a 36 year old widower, very strong and muscular. He has brought his two sons on this pilgrimage to Jerusalem for the Passover. They have been camped outside the city gates among other pilgrims who have come from afar. They have been in Jerusalem for a week. PROPS: 1) an artificial fire that can be switched or plugged in 2) a canvas drop cloth that looks like a downed tent and some poles that look like tent poles 3) a pottery cup 4) a pack. COSTUMES: The characters are dressed in the common Bedouin clothing of the times. SETTING: Late at night the day Christ was crucified. Two teenage boys huddle by an unlit camp fire, alone amongst a caravan camp just outside the city gates of Jerusalem during Passover, 33 AD. There is a collapsed tent and poles behind the boys. AT RISE: Complete darkness. In the darkness of night, Rufus and Alexander are huddled by a small fire pit. Behind them is a pile of canvas and some poles on the ground. The night is still. Lights come up just enough to see the two characters center stage. Rufus, I’m scared. What are we going to do? Father should have been back by now. What if the Romans still have him? Calm down, Alex. He didn’t do anything wrong. He just did what they said – he carried the poor man’s cross. He said he’d meet us back at camp and that’s just what he’ll do. He will. O.K., but it’s getting awfully late. Can’t we build a fire, Ruf? I’m getting cold. I guess so. I think the flint is in Father’s pack – which is probably inside the dumb tent. I can’t figure out how this tent collapsed. Humpf. Someone’s idea of a bad joke, I suppose. Here it is. It wasn’t in the tent. I was sitting on it. When Father gets back we can pitch the tent again and get warm. It’s me, Ruth. You sure are jumpy. You’d be jumpy too if you’d seen what we saw this afternoon. What are you doing here? Shouldn’t you be at your master’s camp? Nobody’s there. After they ate the evening meal, they went somewhere to do business. I stoked the fire and laid out their beds. Then I saw your fire. Where’s your father? I heard there was a riot in the city over some rabbi getting crucified. You were in town all day. Did you see anything? You remember this morning when we left camp with Father? We were going to the Temple to give our offering. Right. To celebrate the Passover. (Boys looked surprised.) Hey, even a slave girl knows about Jewish festivals. After all, I am a Hebrew, you know. OK. OK. Well, when we got there, there was all sorts of commotion. A mob was gathered in the Temple courtyard and they were crazy! They kept yelling “Crucify him, Crucify him”. We’re trying to tell you! That rabbi we told you about, Jesus of Nazareth. The one they say is the Messiah. The one who was going to free us from the Romans. That’s what my master and his friends say. But that man preaches peace. Why would the Romans care about him? It was the chief priests that wanted to get rid of him. Father said the first time he heard Jesus teach, the words were revolutionary. He was bound to make the Jewish leaders angry calling himself the son of God! But why? Your father said Jesus preached peace. And he healed people! They’re going to crucify him for that? I don’t understand. They’re angry because he said he was God. That’s blasphemy. But you said earlier this week that the people loved him. You said they had a big parade and called him their king. You should have seen those same people today. It was just like that parade never happened. They were vicious. I don’t understand it either. We’ve been following Jesus all week with Father. We’ve listened to Jesus teach. He was – I don’t know – gentle somehow. But at the same time, he seemed powerful, his words anyway. Father told us that he believes Jesus really is from God. A lot of other people thought so too. And where were they when Jesus was put on trial today? Father said they just let Jesus be thrown to the wolves. I guess they didn’t believe him after all. Not only didn’t they believe him, but Father said they set him up. They brought in people to lie about him. And then they talked the Romans into killing him. The Procurator – um, Pilate I think his name was- even he thought Jesus wasn’t hurting anybody. But the mob ruled. It was horrible! One minute we were standing in the crowd and the next we were being pushed along behind the Roman soldiers. Father held onto us tight or we might have been trampled! Where was the crowd going? You mean you were following Jesus and the guards? To that big hill where the Romans crucify people. Father said it’s called “The Skull”. All of a sudden this soldier pushed me aside and I saw him! I’ve never seen so much blood in my life. I almost threw up! And they were making him carry the heavy cross beam. I knew he’d never make it. He could barely stand up! Ruth, they’d whipped him so badly that the skin on his back was hanging in pieces. They’d beaten him so much … (his voice breaks) He was so swollen, he didn’t look like a man anymore. On top of that, they made this ring of sharp thorns from those bushes, you know, the ones along the desert road? They pushed it down so hard into his head that there was blood running down his face. He couldn’t open his eyes. Blood was dripping from his hair! How could anyone stand it? Why didn’t you run away? Because Father said “He has not one friend here. Someone has to stand by him. If he looks up, I want him to know I am his friend.” I suppose Father thought he could help, but there was nothing anyone could do. So of course you had to stay. Then, when I thought I couldn’t stand any more, Jesus collapsed. The beam fell on his back. I thought he was dead. But this woman ran over to him and poured water over his head and in his mouth. She kissed him and he put his hand on her face. I don’t know. It might have been his mother. That’s when two Roman soldiers grabbed Father. “You! Carry his cross!”, they shouted. What?! Your father? He is one of the strongest- built men I ever saw, but, oh my gosh! Your father! Then Father picked up that beam. He lifted it up across his big shoulders and kept walking. The soldiers picked up Jesus. They had to practically carry him the rest of the way. The rest of the way? You mean you followed them? Your father told you to come back here. I know, but we couldn’t just leave him. We stayed, moving along with the crowd as long as we could until we got shoved off into an alley. We don’t know what happened to Father! We’ve just been sitting here in the dark waiting. This city is full of nooks and crannies. We got lost. We must have wandered around for hours until we finally recognized the right gate. We barely made it out before they closed the gates at sundown. But that was hours ago. Where is your father now? That’s just it. We have no way of knowing if he is OK or if he’s in prison or…why didn’t I stay? Rufus? Do you think we could pitch the tent now? 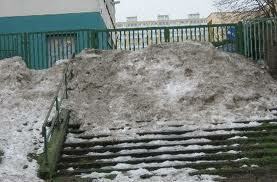 Maybe Father is on his way and then he’d have a warm bed to climb into when he gets here. What do you think? Ruf? Come on Alex. I’ll help you with the tent. Hey, Ruth. You were here all afternoon. How did our tent get knocked down? Did it get real dark where you were – I don’t know- maybe about three o’clock? Yeah! It gave me the willies. Like a giant rainstorm, only it didn’t rain. It did something worse. Did the ground start to shake all of a sudden? I’ll say! We were in this narrow street and I thought the buildings were going to fall on us. Right, Ruf? (speaks in Rufus’ direction but with no response) I’ve never run so fast in my life! It was an earthquake then, for sure. The camels and donkeys started braying and acting wild. Then the ground shook all around camp. I was petrified! It knocked me flat on my face in the sand. Next thing I knew, it was over. Quiet. But everywhere I looked the tents were on the ground. It’s when Jesus died. God made the earth shake and he hid the sun because his son was dead. Oh, Rufus, what if the Romans crucified Father too? They didn’t. I just know they didn’t. I have this feeling in my gut that God didn’t let that happen. See, I told you he was all right. Father, you are all right, aren’t you? Father, where were you? What happened? Bring me some drink, will you son? I’m so thirsty. Oh, my dear sons. Our Messiah is dead. They crucified him. He died right before my eyes. But Father, you said he was the Messiah. Was it a lie? Was Jesus of Nazareth the son of God? You know, when they were ready to cut him down from the cross, the sky turned black … angry. I have never felt so lost in my whole life. Not even when your mother died. I can’t explain it. Who knows how any of us would have reacted had we been there that day with Simon of Cyrene? The tension created between wanting to believe the words Jesus spoke before he was crucified and accepting the reality of his death on that cross, tore the early believers apart - especially in the hours between his death and Easter morning. They were frightened, disillusioned and grief-stricken. Because of its revolutionary impact on our world and our lives, Easter is the most significant date on the calendar. 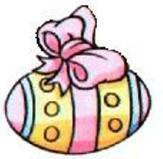 We recognize it as a celebration because of our personal application of its truth. It was not simply a raising from the dead but a resurrection, a transformation, a victory, and a once and for all, life-changing event for all who would believe. The week leading up this event is often called “holy” week. The word holy means “set apart”, sacred. It seems as though the ups and downs of holy week parallel the ups and downs of our lives. The horror of the events of “Good Friday” are the culmination of all the suffering in the world and the absolute worst of the worst. It’s this deep sadness, tremendous suffering and total sacrifice that leave us begging for resolution, yearning for the happy ending, longing for hope. 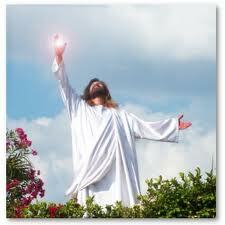 That hope burst through on that Easter morning beyond our wildest dreams and expectations! And for those who are humble enough to receive it - those willing to believe - it is a happiest of days, worthy of our greatest rejoicing and our most elaborate celebration. It is the reason for joy beyond comprehension, joy that does not end in death, but joy that only begins to taste it’s fullness in the forever after. So for this “Holy Week” I invite you to take the journey. Read the passages of scripture above, reflect on what people must have felt, allow the ups and downs, the minor set backs, the short reasons for happiness and the building to the climax affect you emotionally. Go there, be there, journey with Jesus to his final hours. Listen as the last words are spoken, sense the emptiness of a black Friday and look forward with hope because Sunday’s coming!. Oh, O, sometimes it causes me to tremble, tremble, tremble. D-mail for April 14, 2011 What Did You Give Up for Lent? Many Christians have been denying themselves something for the last six weeks or so, known in the church as the period of Lent. Lent is a special time of prayer, penance, sacrifice and good works in preparation for the celebration of Easter. According to Father William Saunders, a church historian at the Catholic Education Resource Center, there is evidence of some kind of Lenten preparation for Easter going back to the fourth century. Over the years, modifications have been made to the Lenten observances, making our practices not only simple but also easy. Ash Wednesday still marks the beginning of Lent, which lasts for 40 days, not including Sundays. The present fasting and abstinence laws observed by Catholics are very simple: On Ash Wednesday and Good Friday, the faithful fast (having only one full meal a day and smaller snacks to keep up one’s strength) and abstain from meat; on the other Fridays of Lent, the faithful abstain from meat. Christians of many denominations are still encouraged “to give up something” for Lent as a sacrifice. Although the practices may have evolved over the centuries, the focus remains the same: to repent of sin, to renew our faith and to prepare to celebrate joyfully the mysteries of our salvation. When I was growing up, just before Ash Wednesday, it was common to hear the question, “What are you giving up for Lent this year?” Although the idea was to sacrifice something dear to you in order to model the sacrifice Christ made on the cross, sadly the answer to the question was frequently such things as television, chewing gum, eating candy, and the like. Hopefully, as we grew into mature Christians, our understanding of Lent was that we should sacrifice the time we would normally spend on worldly things in order to spend it in prayer and scripture reading and attending special worship services. In order to make a true sacrifice, you have to understand the difference between abundance thinking and scarcity thinking. These terms actually originate with the CSO (Chief Solutions Officer) of Yahoo in his book, Love is a Killer App. He writes that he carries a sign to every meeting he attends. When anyone expresses a “but we don’t have…” thought, he or she gets the sign, which says in large black letters, SCARCITY THINKER. It is the dreaded sign at his meetings. He instead rewards abundance thinking, which says “we can use what we have here and make it work to accomplish…” He tells about an experience he had that changed him forever and gave him the idea of scarcity vs abundance thinking. He was volunteering at a homeless shelter. The men who came there had nothing except the clothes on their backs. One day he observed two homeless men sitting on the curb. As one man pulled a cigarette out of his pocket to light up, the other man asked him if he could “bum a cigarette”. Thinking for a minute, the first man reached into his pocket again and pulled out two cigarettes. There was no package - only two single cigarettes. It had probably taken him quite a while to find these two cigarettes and who knew when he could get another? To this man, the cigarettes were very valuable. But he smiled and held out one cigarette to his companion. That was abundance thinking in a scarce situation. How many of us are willing to give up something so valuable to us when we don’t know whether or not we will get another? You have two cars in your driveway. A neighbor’s only car is stolen and he asks you for the use of one of your cars. Would you give it to him freely? In Mark 14 we find the story of Jesus and the woman with the alabaster jar of nard, a very precious oil. Nard came from India and was ridiculously expensive. 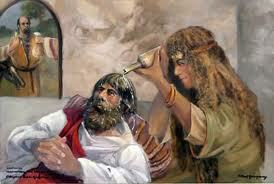 When the woman opened the jar and began to anoint Jesus with it, the disciple, Judas, jumped up and furiously objected. He insisted that the oil should not be “wasted” in this way when it could be sold to feed the poor. Jesus answered, “Leave her alone. Why are you bothering her? She has done a beautiful thing to me. The poor you will always have with you and you can help them any time you want. But you will not always have me. She did what she could. She poured perfume on my body beforehand to prepare for my burial. I tell you the truth, whenever the gospel is preached throughout the world, what she has done will also be told in memory of her. Then Judas Iscariot went to the chief priests to betray Jesus to them. They were delighted to hear this and promised to give him 30 pieces of silver.” Mark 14:6-11 Judas must have been pretty disillusioned because, after three years of close companionship with Jesus, he was willing to give Jesus’ life away for the equivalent of $10,000 - roughly the price of a used car today. So who of the two was a scarcity thinker and who was an abundance thinker? The woman had probably given all she had to buy the perfume, but she “gave it up for Lent” in order to show her love for Jesus, her Lord. She trusted that God would take care of her despite the loss of her treasure. What are you wrestling with God about? What is He asking you to give or give up? What is in your alabaster jar? It could be the tithe, or a car for your neighbor, or it may not be money at all. Maybe it is your time or your labor or anything you have in abundance. Can you trust God to take care of you as you throw off your scarcity thinking and give abundantly of what you have? Here’s a novel thought. What if God is asking you to give up a behavior you have in abundance? How about giving up anxiety for Lent? Or bitterness? Or grumbling? They say that after 30 days of establishing a new behavior, it becomes a habit. So 40 days should be even better. 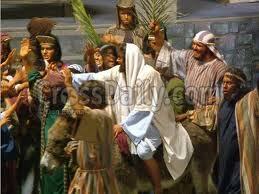 This Sunday is Palm Sunday, which begins Holy Week, the week leading up to Jesus’ crucifixion. If you have been faithfully fasting or have given up something during the last seven weeks as God has led, I pray that it has been a fruitful time for you and that it has drawn you closer to God. In my church during early April, those who wished to experience what it means to feel hungry - at least as hungry as those in a refugee camp feel, had the opportunity to collect the same amount of oats, rice, and beans that a family in a refugee camp receive in a week. We were given instructions on how you could prepare a week’s worth of meals with your provisions. We were asked to take the money you would have spent on groceries or eating out during that week and give it to a mission program that feeds the hungry. It was a beautiful picture of sacrifice during Lent. If you haven’t had the opportunity to sacrifice (or give) during Lent, the good news is that God doesn’t watch the calendar! If He is leading, you can do it any time. we run out of forever.